Launched in 2005, SI VIS PACEM is a smooth contemporary cruiser, combining performance, safety and refined Italian styling. Charter yacht SI VIS PACEM combines two design powerhouses, with the naval architecture of Farr Yacht Design, and the styling of Nauta Design, who worked to create the general concept of the project, the exterior styling and the interior design. The aesthetic of SI VIS PACEM is modern and sophisticated, with many incredible features, such as a panoramic deck saloon allowing a 270-degree view. Built by Southern Wind Shipyards, SI VIS PACEM mixes advanced materials and construction techniques with its well-established craftsmanship. This carbon-hulled performance sloop is built for long-distance cruising and will entertain sailors of all experience levels. 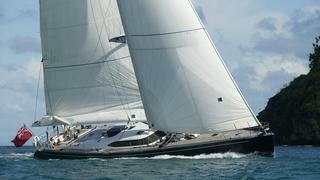 She was the first prize winner in the Millennium Yacht Design Award in 2007 for sailing yachts of 80ft and over for “the quality of build and design suitability for long distance cruising”. SI VIS PACEM has a generous sunbathing area, located between the crew and the central cockpit dedicated to the guests. The saloon, surrounded by panoramic windows is the real social heart on board where guests may relax sitting on the comfortable settees. On port side, a dining table comfortably accommodates guests and it is surrounded by a U-shaped sofa. The master cabin is an authentic “suite”, with a king-size central bed, sofa and office/vanity desk. There is abundance of storage room with lockers and book-shelves. SI VIS PACEM is definitely the perfect blend of luxury cruising and enjoyable sailing.